Day 5: Go Green Already! Combine holiday spirit, environmental consciousness and caffeine all in one tidy, convenient gift. 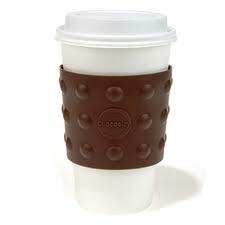 Re-usable coffee cups are everywhere these days. It always kind of bugged me that when I'd stop somewhere and order coffee to go...it came with an extra sleeve of paper around the outside. Here's a simple way to make a statement for more responsible packaging and still enjoy your morning brew. You can find these in any of the locally-owned gift shops around town, and if I'm not mistaken...a lot of coffee shops will give you a small discount for bringing in your own cup!